We were looking for financial freedom, a more simplistic and less consumeristic lifestyle, but we weren’t looking for a $5,000 dwelling or even a $20,000 one. We knew that if a tiny house were going to work for us we were going to have to love being in it and for us, that meant a kitchen we could cook in with upgraded appliances, tons of upgraded windows to keep the heating/cooling inside while letting the light and “space” of the outside in…and a construction that would last our lifetime. We also knew that we weren’t going to be able to build it ourselves so we were going to have to pay for someone else’s’ time and experience. Sure, we had the ability to access a large chunk of cash in the immediate to build our tiny house, but the goal was to learn to live a more simplified life now so that we were financially more stable later down the road. Sinking that money into a big house would have done nothing to facilitate that PLUS it wouldn’t have addressed the other reason we went tiny, and that was to be an advocate for the entire movement!…We decided that even if we couldn’t live in our tiny house right away, we could use it to spread the word about the tiny house movement. Exposure and education was the key to changing regulations and giving the tiny house movement the foot-in-the-door it needed to be legal so that the people who did truly need dwelling options that were more affordable would have access to them. Our situation is slightly different in that we DO live in our tiny house full-time. 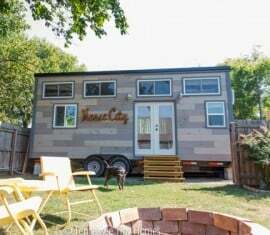 But the goal and desire to push forward the acceptance of the tiny house movement as a whole really resonated with me. Ultimately, what I’m trying to get at is that not everyone in the tiny house movement is looking for a cheap place to live. Some people are looking for simplicity/minimalism, some people are looking for mobility, some people are looking for a luxury they wouldn’t be able to afford in a “big” house, and some are looking for something else all together. That doesn’t make them unworthy of the tiny house movement, it doesn’t mean they’re soiling the movement or detracting from the movement. The movement isn’t about money at all, it’s about the freedom to live within your means, whatever those means are. And in my opinion, those who NEED the cheap housing also NEED the people who can afford to make fancy expensive tiny houses so that they can gain exposure and move the movement forward. This movement requires all types and we need to work together. The tiny house world is a mixed bag. Sure, some people just want a very cheap home. But many to do not, and it takes those people too — lots of them — to make this work for all of us!. I don’t want to get into too much detail here, but this is why I also disagree with some people’s push to making tiny houses the next solution to affordable housing for the homeless. That is a great cause, but not necessarily the color to use when painting the future of the movement as a whole. Thank you John and Sarah Murphy for sharing your viewpoint on tiny living! It’s always encouraging to hear others with the similar motivations! ← Tiny House Inspiration: Visit to Vina’s tiny house in Ojai! Thanks for sharing this Alek, it’s an important topic to address as we’ve noticed a lot of backlash and negativity directed toward any tiny house projects that cost over a certain arbitrary amount. I think the cost is secondary to the main virtues of the movement, which in my mind are to live simply, gain more freedom, and ultimately increase happiness. While the standard figure for tiny house square footage might be less than 500 sf, there’s no concrete answer to what a build should cost. Everyone’s financial situation is different, and it’s up to the individual to decide what they can afford. Honestly if someone who can afford a $500k house decides to go with a $100k tiny house instead, I think that says a lot about their integrity and values because they make a willing decision to live well below their means, financially speaking.